LONDON, GREATER LONDON, UK, February 13, 2019 /EINPresswire.com/ -- The packaging industry will provide the best opportunities for printing inks manufacturers, Printing Inks Global Market, Opportunities And Strategies To 20221 from The Business Research Company2 shows. This market will add over $3 billion of annual sales by 2022 from increased consumption worldwide of packaged food and beverages and growing demand in emerging economies for other packaged consumer products such as cosmetics, toiletries and pharmaceuticals. By formulation, water-based printing inks will grow most by 2022, ahead of the solvent- and oil-based printing inks market; by type of product, offset printing inks will present the greatest opportunities. The global printing inks market is expected to grow to around $38 billion in 2022 at an annual growth rate of nearly 3%. Fast growth in the forecast period is expected from the continued increase in the demand for printing inks from the packaging industry. Going forward, the market for printing inks is expected to grow with the launch of high-quality digital printing applications on flexible packaging and labelling. In 2017, Siegwerk Druckfarben AG & Co. KGaA entered into a strategic alliance with Agfa Graphics for the research and development of digital packaging inks. Companies in the printing inks market are also expected to see a demand for UV inkjet inks, as they require less maintenance, have high printing speeds, and are especially suitable for flexible packaging products. Growing demand for digital printing due to the need for high quality printing will lead to an increase in demand for packaging printing. Government incentives in favor of the packaging industry also contribute significantly to the printing inks market. For example, Nigeria’s government offers various incentives to companies to invest in the country’s packaging industry, including 3 years' tax holiday, and 100% capital allowance. Printing Inks Global Market, Opportunities And Strategies3 To 2022 is one of a series of new reports from The Business Research Company that identify opportunities and explain strategies, provide a market overview, analyse market size and potential, forecast market growth and explain market trends, drivers, restraints, and leading competitors’ revenues, profiles and market shares in over 300 industry reports, covering over 2400 market segments and 56 geographies. The market reports draw on 150,000 datasets, extensive secondary research, and exclusive insights from interviews with industry leaders. Market analysis and forecasts are provided by a highly experienced and expert team of analysts and modellers. The reports identify the strategies most likely to succeed, and the segments, subsegments and countries that present the best market opportunities. Markets Covered: Global chemicals market, global printing inks market, printing inks market by formulation (oil-based, water-based, solvent-based); by product type (offset, flexographic, rotogravure, digital), by end use (packaging, print media, commercial printing). Data Segmentations: Printing inks market size, global and by country, historic market size, by value and by volume; forecast market size, by value; growth rates for the world, 7 regions and 12 countries; printing inks market segments – by formulation (oil-based, water-based, solvent-based); by product type (offset, flexographic, rotogravure, digital), by end use (packaging, print media, commercial printing)- market size, historic and forecast size, and growth rates for the world, 7 regions and 12 countries. Global chemicals market size and growth rates 2014-18 and 2018-22. Other Information And Analyses: Global printing inks market comparison with macro-economic factors, printing inks market size as a percentage of GDP, per capita average printing inks market expenditure, global and by country; printing inks market customer information, PESTEL analysis, trends and opportunities, drivers and restraints, geographic and regional analysis, company profiles and financial analysis for top 5 printing ink manufacturers, key mergers and acquisitions, market entry/expansion strategies. Strategies For Participants In The Printing Inks Industry: The report explains over 30 strategies for printing inks sector companies, based on industry trends and company analysis. These include printing inks companies considering to enter into strategic collaborations to have access to new technologies, technical know-how and digital transformation to meet rising market requirements and standards, and Toyo Ink’s business strategy which aims at focusing on increasing its product offering in developing economies. 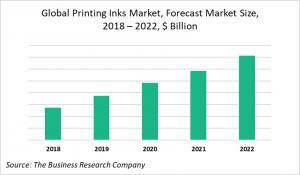 Opportunities For Printing Inks Sector Companies: The report reveals where the global printing inks industry will put on most $ sales up to 2022.